Can you believe Christmas has come and gone for 2012? I remember as a kid being so sad when Christmas was over and then it always seemed like FOREVER before it was Christmas again. Now that I’m older, it seems like I blink and it’s Christmas again. Oh do I miss those days when time seemed to go much slower. I hope you had a Merry Christmas and enjoyed spending time with your family and loved ones. I love the holiday season, but don’t love the cold weather that comes with it. I am already tired of the snow and cold and am anxiously counting down the days until Spring . . . it can’t come soon enough. With New Year’s Eve just days away, I have a great recipe to share. 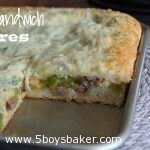 These sandwich squares are a great thing to make when you’re feeding a small crowd. It’s a pizza and sandwich combined and is absolutely delicious! You will love these because of how simple they are to make and because of how incredibly good they are. This recipe comes from one of my many old issues of Taste of Home Magazine. My boys absolutely love when I make these for dinner. You could easily change up the filling and use pepperoni, olives, ham, pineapple, etc., but I have to admit, the sausage with the peppers is really my favorite combination. Because I have a couple boys that are so dang picky, and don’t know what they are missing out on, I do leave peppers off of half of it for them (maybe one day they’ll get some real taste buds). Enjoy and I hope you have a safe and HAPPY NEW YEAR! In a large bowl, dissolve yeast in 1/2 cup warm water. Add the salt, remaining water and 2 cups flour. Beat until smooth. Add enough remaining flour to form a firm dough. Turn onto a floured surface; knead until smooth and elastic, about 6 minutes. Place in a greased bowl, turning once to grease top. Cover and let rise in a warm place until doubled, about 50 minutes. In a large skillet, cook sausage over medium heat until no longer pink; remove with a slotted spoon and set aside. In the drippings, saute peppers and onion until tender; drain. Press half of the dough onto the bottom and 1/2 in. up the sides of a greased 15-in. x 10-in. x 1-in. baking pan. Spread sausage evenly over the crust. Top with peppers and onion. Sprinkle with mozzarella cheese. Roll out remaining dough to fit pan; place over cheese and seal the edges. In a small bowl, beat egg and water. Stir in the remaining ingredients. Brush over dough. Cut slits in top. Bake at 400° for 20-25 minutes or until golden brown. Cut into squares.